Jim Schaff, Yardarm’s vice president of marketing, shows what a dispatcher would be notified of when the sensor records activity in the field. SANTA CRUZ, Calif. – Amid the ongoing debate over officer-involved shootings, the county sheriff’s office in this California beach town was the first law enforcement agency in the world to test new technology: a tiny sensor that records any time a deputy’s gun is fired. Yardarm Technologies Inc., the Silicon Valley startup that makes the sensor, has had only one other testing ground so far – a small police force in Texas – which abandoned the product in January, after officials decided it wasn’t a viable technology for the department. The biggest difference between the two pilot projects? A sheriff gung ho about technology who recently retired and now advises the company. In Santa Cruz, Yardarm has a not-so-secret weapon in former Sheriff Phil Wowak, who championed the project from its debut in 2013, both publicly and within the department. The relationship has proven beneficial to Yardarm, which hired Wowak as an adviser in January, weeks after he retired. Wowak receives a monthly stipend and holds an equity stake in the company, though neither side would disclose the monetary value of that agreement. But the timing of Wowak’s transition from elected office to private company and the fact that he has continued touting the technology to his former employer – and his successor, Sheriff Jim Hart – violate the intent of state ethics law. California’s Political Reform Act is firm on the subject: It bars elected officials from attempting to influence their former employer on behalf of another entity for a minimum of one year. Regulators at the state’s Fair Political Practices Commission, charged with enforcing the law, don’t comment on cases the agency hasn’t investigated yet. When Reveal outlined Wowak’s situation to spokesman Jay Wierenga, he said it “would be something for us to look into.” The agency can fine former officials up to $5,000 for each violation of the act. Yardarm hopes to announce partnerships with other agencies by the end of the year. The Santa Cruz County Sheriff’s Office was set to be the first to expand the testing, with its SWAT team scheduled to add the sensor to its Glocks this fall. 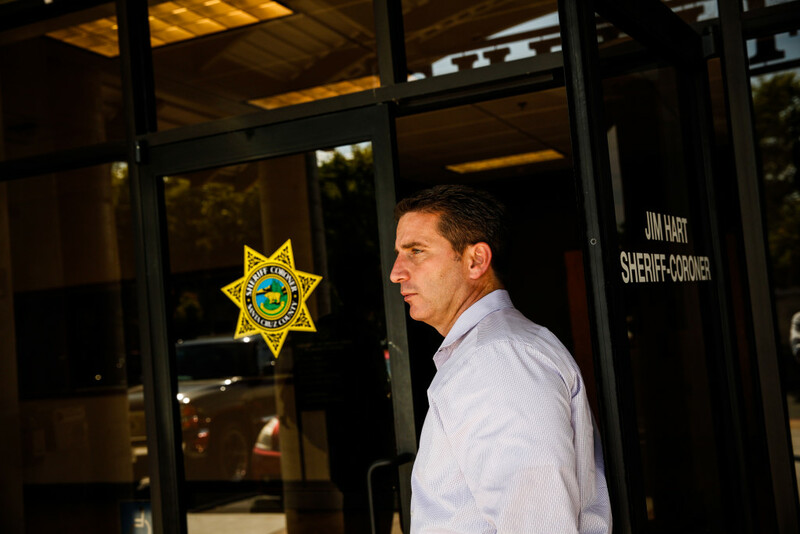 After confirming the expansion was on track last week in an interview with Reveal, Sheriff Jim Hart has reconsidered. He now says he is putting the next phase of the project on hold. Wowak defended his position with the company and insisted it is not an issue. Both Stewart and Wowak note that the pilot has been free for Santa Cruz and say they intend to keep it that way. The lack of taxpayer funds involved means the project never came before the county’s Board of Supervisors for a vote. The sheriff’s office, however, has invested hundreds of man-hours testing the technology. 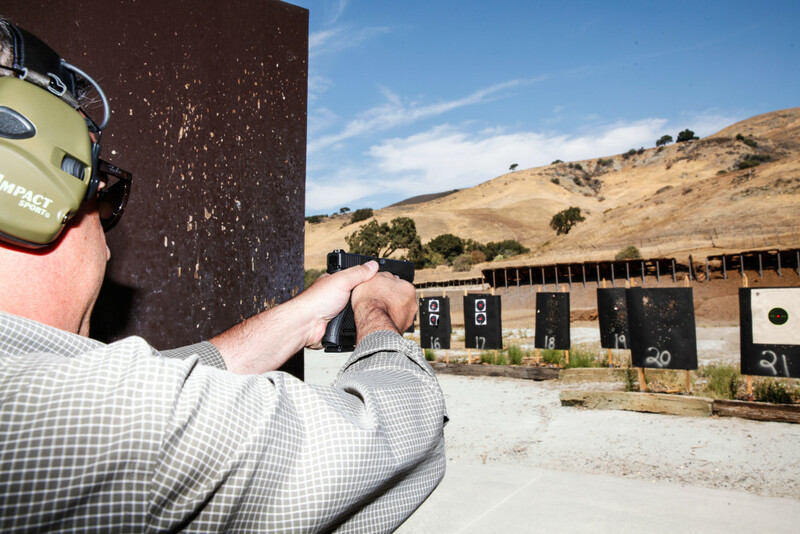 Jim Schaff arranges his gear in a neat row behind the firing line of a San Jose gun range. Spread out on one side of the table are the standard fare at a range: a Glock 22 pistol, a couple of magazines and a half-empty box of ammunition. On the other side rest a white electronic tablet, a cellphone and a finger-sized sensor. Schaff, Yardarm’s vice president of marketing, describes the evolution of the 3-D printed sensor, used in the company’s first pilot test last fall in Santa Cruz. Via an officer’s cellphone, it alerts dispatchers when a gun is unholstered or fired. 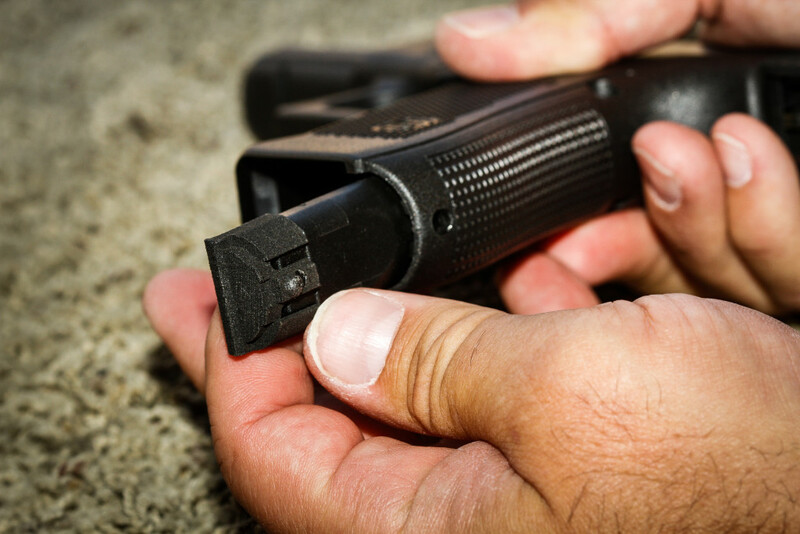 The sensor can signal that backup is needed while also creating an electronic record of when an officer shoots his or her weapon, what direction it’s facing and how many rounds are fired. Once Schaff gets the all-clear from the range master, he steps up to the firing line. He draws the gun and points to a gray dot on his tablet, which pinpoints the gun’s location on a Google map. 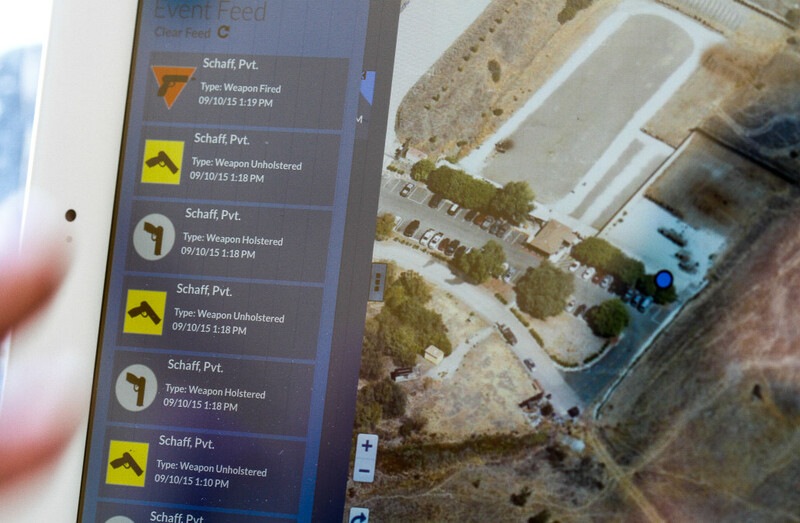 The sensor is relying on Schaff’s cellphone connection to alert his tablet – set up to simulate a dispatcher’s computer – that the gun has been drawn. But the cell signal is weak. He puts his gun back in its holster, then removes it again. This time, the gray dot turns yellow: weapon unholstered. Schaff fires the gun, sending a single round through a paper target about 8 yards away. After a short delay, the yellow dot turns red: weapon fired. The technology’s reliance on a strong cell connection could be a problem if it’s introduced in Santa Cruz County, where coverage is spotty. Of the 11 beats deputies patrol, at least four have known dead spots, sheriff’s office spokesman Lt. Kelly Kent said. Schaff acknowledged that could limit the sensor’s ability to relay information in real time to signal for backup. 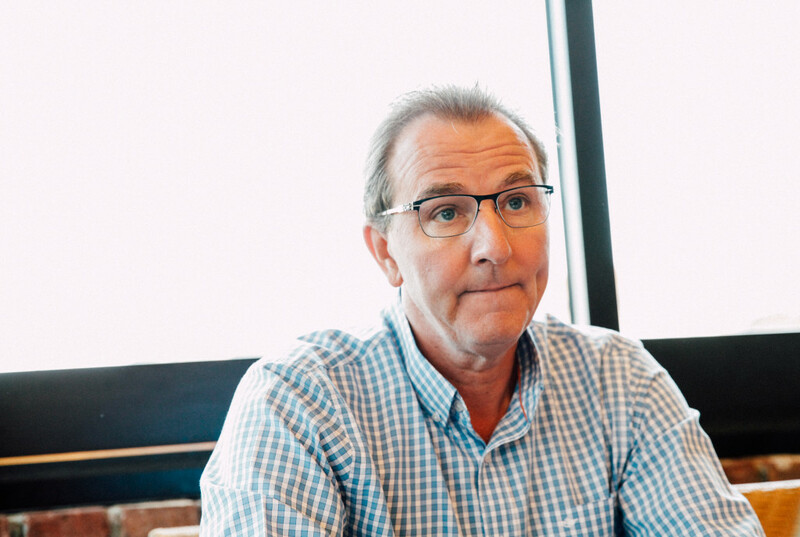 But he insisted that the other goal – creating a record of events that could help reconstruct the scene of officer-involved shootings – still would be met. Yardarm’s headquarters sit on the outskirts of Silicon Valley, and its technology similarly occupies the fringes of the smart gun industry. Most other smart guns differ from their traditional counterparts in one important way: They can be fired only by select individuals. Controlling access to the gun, manufacturers say, will reduce accidental shootings and prevent stolen guns from being used in crimes. Despite years of research and millions of dollars devoted to it, smart gun technology has struggled to overcome fierce pushback from gun rights groups such as the National Rifle Association, which maintains that it could be used to monitor or even confiscate weapons. One industry front-runner was Armatix GmbH, a German company founded by former Heckler & Koch engineer Ernst Mauch that, until recently, made the only smart gun on the American market. But Armatix filed for bankruptcy in May, days before company executives were scheduled to headline a technology fair organized by gun safety groups. And earlier this year, a California bill that would have required the state’s Department of Justice to survey the market and recommend ways to make smart guns more readily available didn’t make it out of a state Senate committee. When Yardarm’s founders debuted their product in May 2013 at a wireless technology conference in Las Vegas, the reaction was swift, with comments such as “I HOPE YOU DIE” directed at company executives in online reader comments at the end of news articles. It became clear that if the company wanted to survive, it needed a new strategy. By the time Yardarm found itself in the spotlight again at the gun industry’s biggest annual event, the 2014 SHOT Show, Schaff had a new approach: Target gun owners who also carry badges – law enforcement, private security and military – a group with which the NRA and other gun rights organizations wield less influence. Yardarm had planned an expansion into the law enforcement market this summer, but setbacks in the early testing phase have pushed that back to 2016. In addition to Santa Cruz, Schaff said two other local law enforcement agencies – one in the Midwest and another in the South, though he declined to be more specific – have agreed to beta-test the sensor. The company has raised $3.1 million in private equity, Schaff said, and is about to close another round of funding. As Yardarm breaks into this extensive and lucrative market, it owes much of its early success to one man: Phil Wowak, the former Santa Cruz County sheriff. “We just clicked with Phil,” Schaff said. 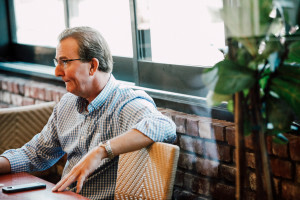 Wowak and Yardarm CEO Stewart first met over coffee in March 2013. They were introduced by Santa Cruz County Supervisor Zach Friend, a past spokesman and analyst for the Santa Cruz city Police Department. The meeting happened weeks after a pair of Santa Cruz police detectives had been gunned down outside the home of a sexual assault suspect with a history of violent behavior. The suspect then took both of the detectives’ guns, which he used in a shootout with police when he returned to the scene less than an hour later. Although Yardarm’s sensor would not have saved the two detectives, the possibility of cutting response time and being notified when deputies’ guns are taken appealed to Wowak. It also fit with his philosophy as sheriff. The following spring, in April 2014, Wowak arranged meetings between Yardarm executives and influential figures in Sacramento. Friend and Wowak attended the meetings, along with Yardarm’s founders. Retired Sacramento County Sheriff John McGinness also came, as did Randy Perry of Aaron Read & Associates LLC, a lobbying firm that represents California law enforcement officers, and public relations expert Rob Stutzman. Stewart’s notes from the meetings detail key points made by each. McGinness warned the company that union representatives might push back if they saw the technology more as a way for management to track officers’ movements than as a tool to keep them safe. Perry echoed this observation, suggesting that “the right first adopter should be secured” so other agencies would follow suit. Stutzman urged Yardarm to present the technology privately to NRA leadership before introducing it publicly. “His advice was to neutralize the NRA with advance notice and appropriate positioning, and they would then not oppose,” Stewart wrote. The feedback was helpful, Wowak said, adding that the meetings reinforced his decision to work with Yardarm as sheriff and were not a favor to the company that he later would join. “What we got out of it was more, ‘Is this thing going to be a boondoggle? Or something that will be embraced for the future?’ That was the big thing,” he said. “I didn’t want to engage our organization in something that was not going to be accepted by law enforcement. None of the meetings’ attendees have been contacted by Wowak or Yardarm since, they said. McGinness said he hadn’t thought about the technology again until Reveal contacted him. Although McGinness also was courted by private companies after he retired, he said he waited six months before considering any job offers. McGinness said he didn’t have an issue with Wowak’s relationship with Yardarm continuing after Wowak left office. Members of Wowak’s SWAT team gathered at a nearby gun range in October 2014. Deputies fired hundreds of rounds using the sensors, making the Santa Cruz County Sheriff’s Office the first law enforcement agency to try out the technology. Yardarm collected data from the testing and modified the sensor’s design, switching from a traditional battery to a sealed unit that’s charged wirelessly. Around the same time, the Carrollton Police Department in suburban Dallas performed its own testing of the sensor. The department was introduced to Yardarm by its new two-way radio provider, Harris Corp. But the excitement wore off quickly in Texas. On Jan. 8, Rutherford emailed colleagues that he had concerns about integrating the technology with the department’s dispatch center, which at the time was being redesigned and remains under construction. Soon afterward, the department ended its partnership with Yardarm. Even as Yardarm’s partnership with Carrollton was ending, its relationship with Wowak as chief law enforcement facilitator in Santa Cruz was just beginning. Wowak had retired in December, and in late January, he signed a contract with the company to continue in an advisory role. Since then, Wowak said he has facilitated several interactions between Yardarm and his former employer, including having the original sensors sent back to the company and urging his successor, Sheriff Jim Hart, to continue with the project. Now, Yardarm executives have their sights set on bigger, more lucrative contracts. In addition to expanding beta testing to other local law enforcement agencies in the coming months, the company says it is actively recruiting at least one major private security firm and the Federal Protective Service, responsible for security at more than 9,500 federal facilities. Recent experience suggests that a proven track record is key. The Houston Police Department expressed interest in Yardarm last year but decided not to jump into the pilot testing. With more than 5,000 officers, the department prefers to buy products that have been on the market for a while, said Sgt. James Turner, who oversees new equipment. Turner had reached out to the Carrollton Police Department when he learned it was testing Yardarm’s sensor, only to learn the department wasn’t planning to pursue the technology further. In Santa Cruz, Hart is apprehensive about the sensor. One person at the dispatch center is responsible for radio calls from his deputies. Could the technology overwhelm or distract? Will it work as advertised? But before taking the next step, Hart has decided to wait to find out how regulators will respond to Wowak’s role in promoting the project on behalf of Yardarm. Asked whether he is concerned that Wowak’s relationship with Yardarm might have violated the law, Hart hesitated, then said he wasn’t sure. “That’s something Phil is going to have to figure out,” he said. Correction: A previous version of this story incorrectly identified the model of Jim Schaff’s gun. It is a Glock 22 pistol.